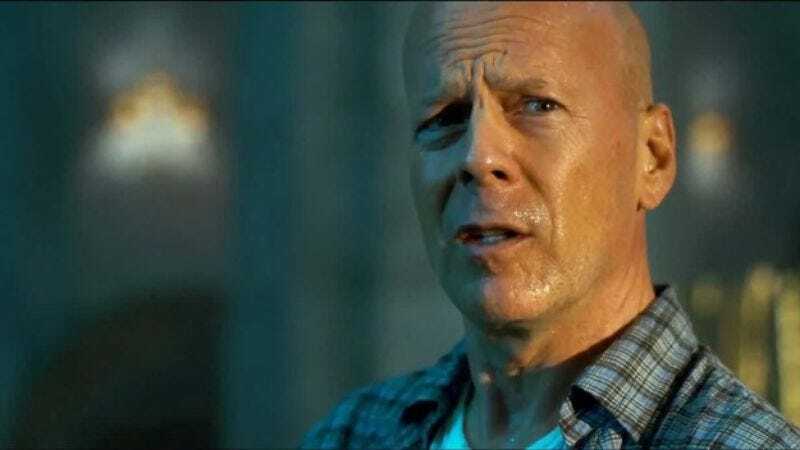 With the box-office success of A Good Day To Die Hard proving that there is no limit to the audience’s excitement for seeing Bruce Willis earn a paycheck, talk is rumored to have begun on yet another sequel—a movie that, fittingly, is a rehashed version of an old idea and would have been deemed ridiculous two sequels ago. Total Film spoke with screenwriter Ben Trebilcook, who says that his spec treatment Die Hardest—which was rejected in favor of what eventually became Live Free Or Die Hard—might be back in play as a potential Die Hard 6, with consulting producer Larry D. Webster reportedly taking an interest in reviving a story that finds John McClane taking his august-years desire to see the world explode all the way to Tokyo. Obviously nothing about any of this is certain, with Trebilcook himself admitting that he still has to convince both producer Alex Young and Bruce Willis that his is the best of all possible contrivances involving Willis visiting a new setting and listlessly shooting guns at it. Still, Trebilcook has faith that his idea “could be the Rocky Balboa of the Die Hard franchise” and boasts “a very plausible storyline”—hopefully in the sense that John McClane finally dies, and then that’s the end of the series.